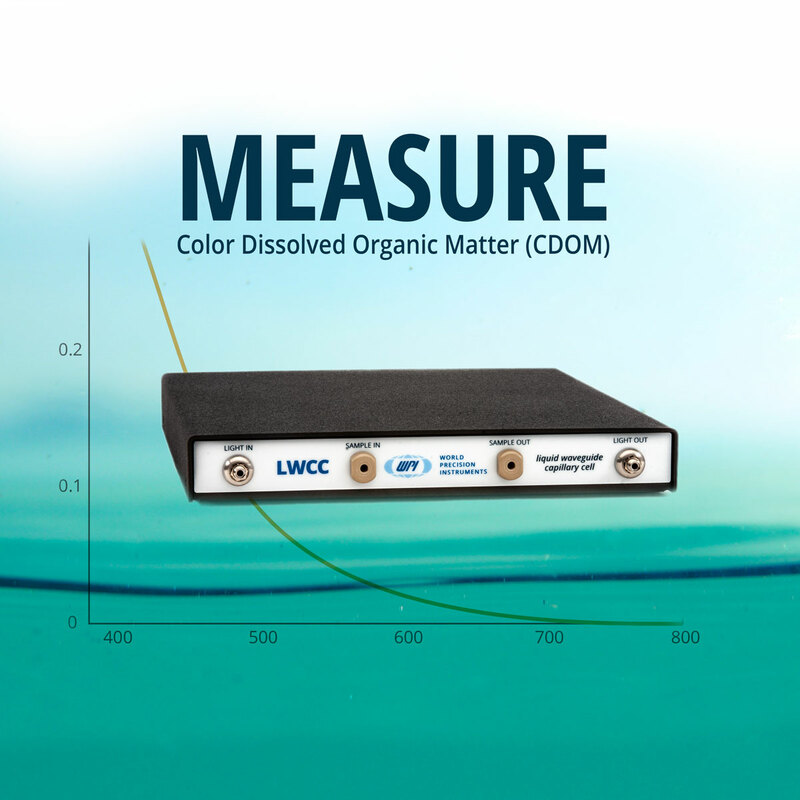 CDOM (Color Dissolved Organic Matter) is organic matter whose optical properties are measurable using WPI’s LWCC (Liquid Waveguide Capillary Cell). CDOM occurs naturally in water systems and is derived from organic tannins. CDOM concentration depends on the location where samples are taken, with coastal waters showing higher CDOM concentrations compared to open-ocean waters. In addition, CDOM absorption depends on open-ocean water depth. Why is the study of CDOM levels important? CDOM is naturally occurring but the environment can influence the level of CDOM in water particles. Measuring the level of CDOM is important because CDOM can have a big effect from fresh to oceanic environments. For example, a higher concentration of CDOM in water particles reduces photosynthesis and negatively affects the food chain. Why use WPI’s LWCC over traditional spectroscopy systems? LWCCs are fiber optic flow cells that combine an increased optical pathlength (1–500 cm) with small sample volumes ranging from 2.4 µL to about 3mL. Select the usable internal volume. Now, you can select components to complete your CDOM analysis system, depending on the selected LWCC. The effective pathlength of WPI’s LWCC is defined as the equivalent pathlength of the cell, if it is assumed that the LWCC follows strictly the Beer-Lambert law: A = ε x c x L, where A is measured absorbance, ε the molar extinction coefficient, c is concentration and L the effective pathlength. Typically, the longer LWCC pathlength is used to increase the sensitivity when the maximal absorbance values are supposed to be <0.1 AU (Absorbance Unit). Inversely, when absorbance measurements are above 1.4 AU, the LWCC pathlength should be decreased to ensure that measurements still remain within the linear range of the LWCC detection system. Absorbance measurements obtained with WPI’s LWCC and Tidas S300 UV/VIS spectrophotometer are linear up to 1.4 AU. The measured absorbance can be converted to the spectral absorption coefficient α(λ), commonly used in oceanography for CDOM measurements. Absorbance and spectral absorption are related by the formula: α(λ) = 2.303 A (λ) / L, where 2.303 is the conversion factor from decimal to natural logarithmic, A (λ) is the absorbance at wavelength λ and L the LWCC pathlength. Determine the biogeochemical cycles, e.g. the organic carbon-based cycle in the ocean. Monitor and map of surface-water masses. Monitor the light absorption of CDOM as it relates to heat storage and the decline of sea ice. Two typical absorption spectra recorded with an UltraPath (UPUV) of a seawater and a fresh water sample collected in November 2007 are shown in the figures. Due to their high absorbance, both samples were analyzed in the 10 cm pathlength. The CDOM sample labeled Mayagüez Bay from oligotrophic, low productive waters with high salinity collected off the west coast of Puerto Rico in the Mayagüez Bay. Special attention should be drawn to the exceptional sensitivity of UltraPath enabling detection of CDOM absorption below 0.03 m-1. To exemplify the performance of the UltraPath in laboratory chemistry and process control, Ponceau S absorbance was measured with the 200 cm pathlength of an UltraPath. Normalizing the Ponceau absorbance graph to AU/cm, the range of this measurement is 150 μAU with a noise level below 2 μAU peak to peak. Sub-nanomolar concentration of this dye can clearly and reliably be detected, which is a novelty in absorbance based spectroscopy. (Left) Two typical absorption spectra measured using UltraPath. The sample labeled “Sarasota Bay” is a CDOM sample with 34 PSU salinity collected from Sarasota Bay (Nov. 2007), and the sample labeled “Pond” is a highly concentrated CDOM sample collected from a local pond in Sarasota, Florida (Nov. 2007). (Right) CDOM Sample “Mayagüez Bay” was collected from the high salinity oligotrophic waters of Mayagüez Bay on the west coast of Puerto Rico (2001). Data courtesy of NASA Stennis Space Center. The useful absorption range calculation is based on the absorbance detection limits of the LWCC, considering a wavelength range of 380—700nm. Refer to the tables below for selecting the LWCC pathlength. (2) UV-Enhanced Fiber Optic Cables, 1 m, 600 µm Core. (2) UV-Enhanced Fiber Optic Cables. 1 m, 600 µm Core.